Milwaukee Brown Trout Fishing Heaven! 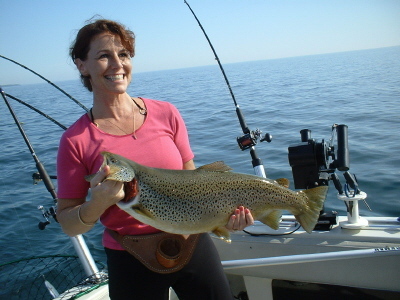 You could do a fishing charter with me at http://www.bluemaxcharters.com/ and I will take care of everything for you. We do put together groups if you have no one to fish with come join the fun. 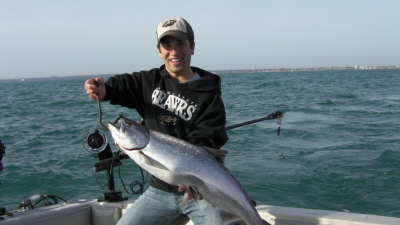 This article will also help you navigate your way to exciting fishing out of Milwaukee on your own with your equipment. Milwaukee fishing is as easy as it gets. We truly have a world-class fishery. There are three launch ramps for trailerable boats within minutes of dozens of hotels. McKinley Marina 1750 N. Lincoln Memorial Drive, South Shore Marina 2900 S. Shore Dr. and Riverfront Launch 650 S. Water. McKinley Marina 414-273-5224 can arrange transient slips for those who would like to do an overnight. For general information on ramps and fees call 414-257-6100. Shopping abounds for the ladies who prefer not to fish. Excellent dining, in all price ranges, will make your family outing complete. The Milwaukee Visitor Bureau 800-554-1448 is a great source of information. Wisconsin has a generous daily bag limit on Lake Michigan. You may keep five total of salmon or trout over ten inches. Possession limit is two daily limits. You may use three rods per person. I would like to share with you some of my keys to finding fish and the hottest set ups for very early presentation. I start my season in early April and the most important factor at this time is temperature. I recommend launching at McKinley. When you come out of the marina, stay inside the break wall. This area is well protected and is always fishable. Proceed south about one mile to the mouth of the river. The best early action will be where the warm river water meets the colder water. The mouth of the river and harbor breakwall gaps is where you want to fish. 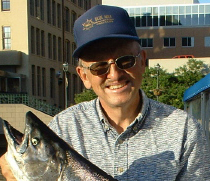 The most active species will be salmon and Brown Trout in the 5 to 12 pound class with many limit catches. Motor trolling is the method I use for most of my fishing, and I will explain one of my basic spring setups. I fish all my lines on planner boards with twenty-pound test line. Use a six foot leader 3/8-ounce keel sinker twenty feet behind the board. I recommend a boat speed of 2.0 M.P.H. Run small crank baits, medium size jointed minnow type lures and bright colored spoons. The color of the lure is dictated by the amount of light and water color. On most days in clear water I use white and black or silver lures. Hotter colors work best in cloudy water. You can’t go wrong with chartreuse in both conditions. The new Badger Tackle Vulcan glow in the dark lures sold at http://www.badgertackle.com are an excellent option call me I will help you pick some of my favorites. Good luck Captain Jim. Jim charters out of Milwaukee, WI. with Blue Max Charters He can be reached at 414-828-1094 or visit his web site at http://www.bluemaxcharters.com Copyright© 2015, James J. Hirt, All Rights Reserved. All species active mostly Lake Trout with some Chinooks and Rainbows. Steady consistent fishing for the last two weeks. Geno Pilaczynski hauled in this hog when fishing with friends. To get my fish reports and how to videos first go to http://www.jimhirt.com By subscribing you will keep ahead of the other anglers. When I post you will get it fast! Chinook and Coho are taking flies and also magnum spoons. Wire divers set to 1.5 with 70 feet of line out have been the most consistent. Chinook are coming in 85 feet of water 35 down. I use the Depth Raider to measure speed at the ball. The boat speed of 1.9 to 2.2 has been best. For Lake Trout magnum Reaper glow spoons presented within inches of the bottom will bring in some hogs with the most running 8-10 pounds. A size 0 dodger and Spin N Glow may be needed on some days. Lead core in 2,3,4,5,6, and eight colors are best for working the Rainbows. I like magnum spoons. Reaper Peacock has been a good choice. Fish are marking from 70 feet and all the way out north or south of Milwaukee to 120 feet. Have a great fishing season. Let’s go fishing! Weather blew us off on Saturday but Sunday was great. In the morning we had Coho Salmon, Brown Trout, one ten pound Lake Trout and Chinooks in the teens. Our new Lowrance HDS Gen 2 is keeping us on fish. The hot bait was the regular size Reaper Peacock made by http://www.badgertackle.com We also had action on Spin Doctors or orange flashers and flies. Check out the photo of Andrew Blade with a great 15 pound 8 ounce Spring King!! April fishing remains average to good when you can get out. The weather has created some problems with presentation and access to the best fishing areas. Our best presentations are 2,3,4,and 5 color Cortland lead core and downriggers 12 to 45 feet down. The fish have been on regular and magnum spoons. The Reaper Magnum and regular Peacock Silver spoon by Badger Tackle have caught most of our fish. Six inch orange dodgers and Johnnie Peanut Flies are also doing a good job. Our best boat speed is 1.7 to 2.0 mph. Slide Divers are producing very well set to #2 with 70 feet of line out. 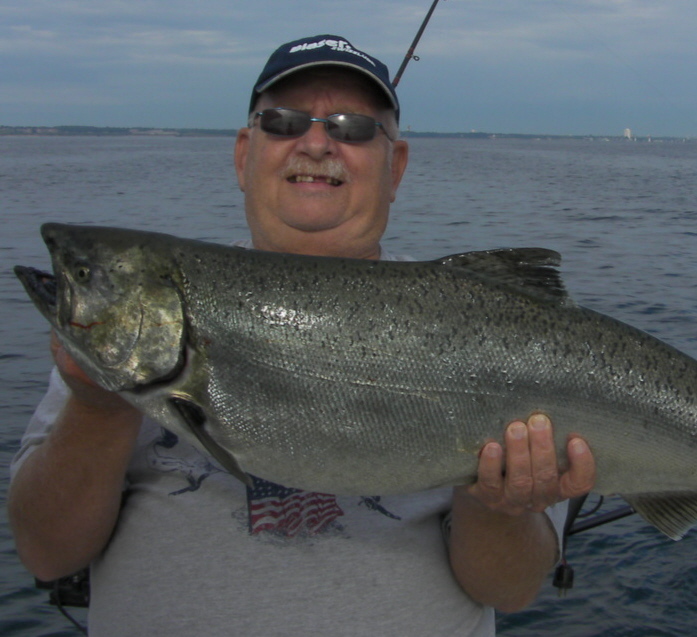 Head northeast out the north gap Milwaukee and fish north in 45 to 70 feet of water. Out in front of the water filtration plant is a good option for small boat anglers. Water color may be an issue if it is cloudy move in and out of the cloudy water for the best action. The color break is holding most of the fish. Have a great fishing season. Let’s go fishing!! Jim charters out of Milwaukee, WI. with Blue Max Charters. He can be reached at 414-828-1094 or visit his web site at http://www.bluemaxcharters.com Copyright© 2012, James J. Hirt, All Rights Reserved. Article number one focused on presentation and this is very important. Now let’s talk about water temperature and it’s relationship to the correct lure. The best way to break this down is categorize the lure type by temperature Fahrenheit. Cold water means slow to dead slow presentation. Since this article is about trolling I will not go into what an angler might use for lures when shore fishing or when the boat is stopped. For trolling very cold water small seems to work better than large and I go to my smallest lures in this cold water. My set up for this scenario would be half of my baits as one half ounce or smaller spoons and the other half under two inch crank baits. These small baits must work and provoke a strike at speeds less than 1.5 miles per hour trolling speed. Color is determined water color and light. Bright colors or glow colors are always part of my program in spring. Beef up the size of your lures is the way to go. Use the same spoons and cranks in larger sizes as you used for the colder water. I would add to my program a few stick baits in the four inch size. Depending on the water color some of the stick baits in the natural color patterns can be very effective. A increase of boat speed will be required and necessary to bring these baits to life. These larger baits should be run from 1.7 to 2.0 boat speed. At this point you are reaching the optimum temperature of cold water class fish like salmon and some trout. 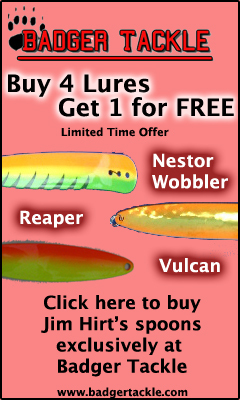 Their metabolism cranks up and you may increase speed, bait size and lure action. Magnum spoons or flashers with flies are a great option for these temps. Wind will dictate where you find the best concentration of fish. Monitor the direction of the wind and this will help you find where warmer water is stacking up. Surface temperature gauge is a must and your key tool to find any increase or decrease of temperature watch it closely! River mouths and break water gaps are important spots to investigate. Anywhere you find a increase in water temperature you will most likely find fish. I keep talking about Vulcan spoons and more anglers are finding out that this spoon will out produce most spoons in their tackle box. Reasonably priced and nearly indestructible they just keep on producing. The regular size is a good bet for spring. Vulcan spoons are sold by http://www.badgertackle.com Good Luck let’s go fishing! 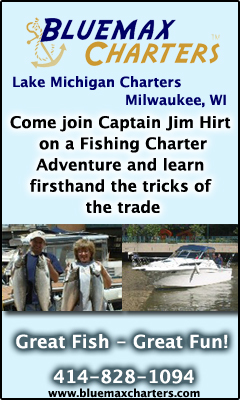 Jim charters out of Milwaukee, WI. with Blue Max Charters. He can be reached at 414-828-1094 or web site at http://www.bluemaxcharters.com Copyright© 2011 James J. Hirt, All Rights Reserved. Motor trolling Set Ups In Spring! http://www.badgertackle.com in regular size are an excellent option. The old rule of thumb applies; bright lures bright days, dark lures dark days. I cannot cover all the bases in this limited space so I will go into more detail in future issues. Good luck Captain Jim. Jim charters out of Milwaukee, WI. with Blue Max Charters He can be reached at 414-828-1094 or visit his web site at http://www.bluemaxcharters.com Copyright© 2009, James J. Hirt, All Rights Reserved.